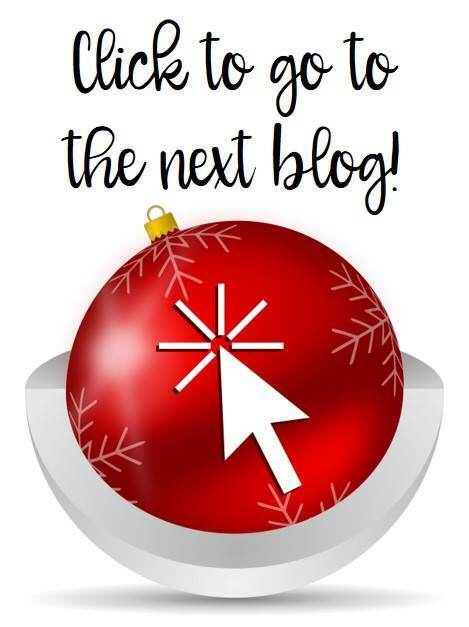 Welcome to my first-ever Holiday Blog Hop! 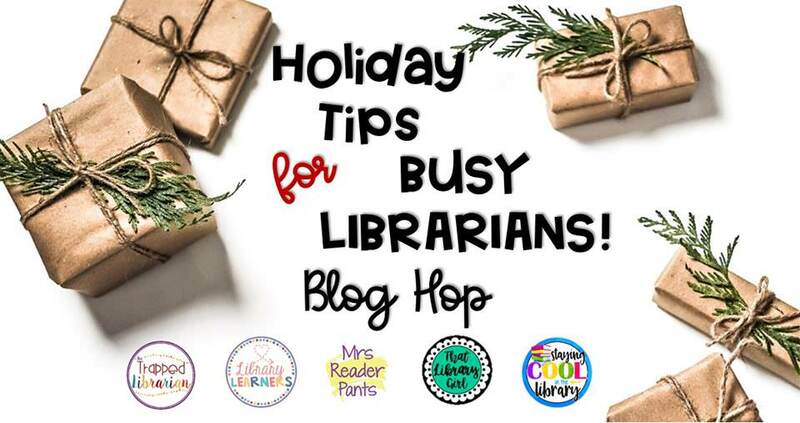 There are five incredibly-talented librarian bloggers participating in the Hop, which includes free ideas, activities, and printables for you to use in December and January. If you are starting the Hop with me, be sure to scroll all the way to the bottom of this post for a link to the next blog (Laura @The Trapped Librarian is featuring Christmas Read-Alouds and freebies), as well as a giveaway for two $25 gift cards to TPT. 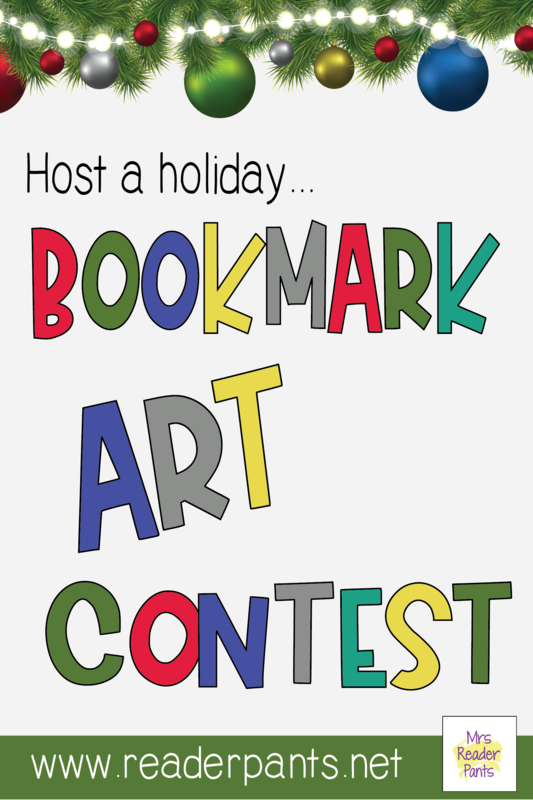 My contribution to the Holiday Hop is...Hosting a Holiday Bookmark Art Contest! This annual activity is happening in my school right now, during the month of November. Read more about it and download free materials to make it happen at your school, too! Looking for something fun to do between Thanksgiving Break and the Winter Holidays? Try a Bookmark Art Contest! Next week, I will start wrapping up our annual Bookmark Art Contest. We do ours every November to coincide with our school's Literacy Month, but this project works well any time of the year. You could also use it to promote school book fairs, Book Week, World Book Day, Dr. Seuss's birthday, Teen Read Week, World Read-Aloud Day, Summer Reading, or any other literacy-themed celebration. Just be prepared to make it an annual event because I can guarantee it will be POPULAR with your students! All grade levels from Nursery to Grade 12 are able to enter their own original bookmark design. Each year I've done it, it has grown increasingly popular, from about 60 entries the first year to 116 last year to what I expect will be over 200 entries this year. Next week, students and staff will get to vote for their 18 favorites, which will be printed professionally and available in the library and given to the student artist. We also have the printer enlarge the 18 winners for display in the library. Long before our Literacy Month and Bookmark Art Contest begin, students start asking if we are going to do the Bookmark Art competition again this year. They have been asking me about it since the first few weeks of school. Of course we are, my darlings! I wouldn't miss this for the world! After you do the contest once, students will be excited and ready for the next one. But if this is your school's first bookmark art contest, you will have to do some extra promotion and reminders. This year, I requested five minutes at a school-wide assembly to talk about our upcoming bookmark art contest. 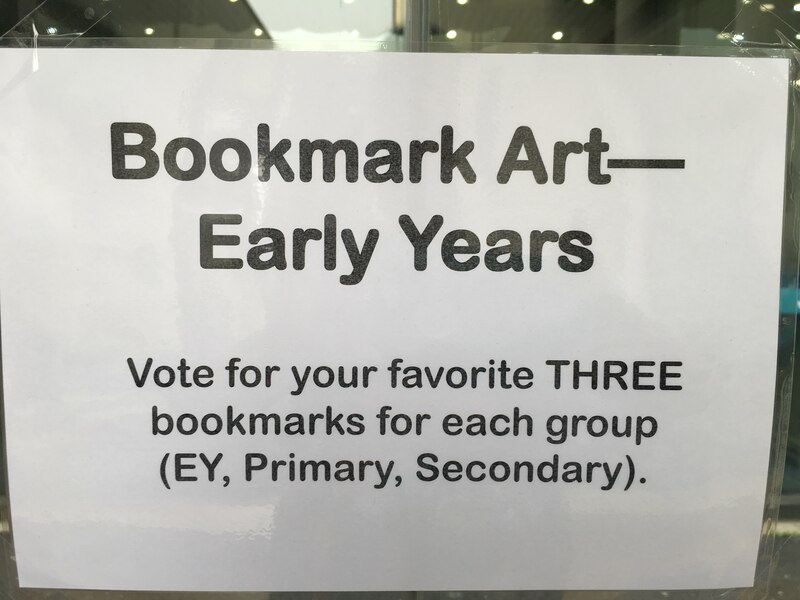 I showed a video of last year's winning bookmarks, photos I took of the voting day, and went over a few guidelines for entries. I also talk about it from my first library lessons to make sure we have tons of participation. It works!!! I've done the first three for you in this free download from my TPT store. All items are editable in PowerPoint, so you can customize them to your school's needs. during lunch--this station is not just limited to bookmarks! 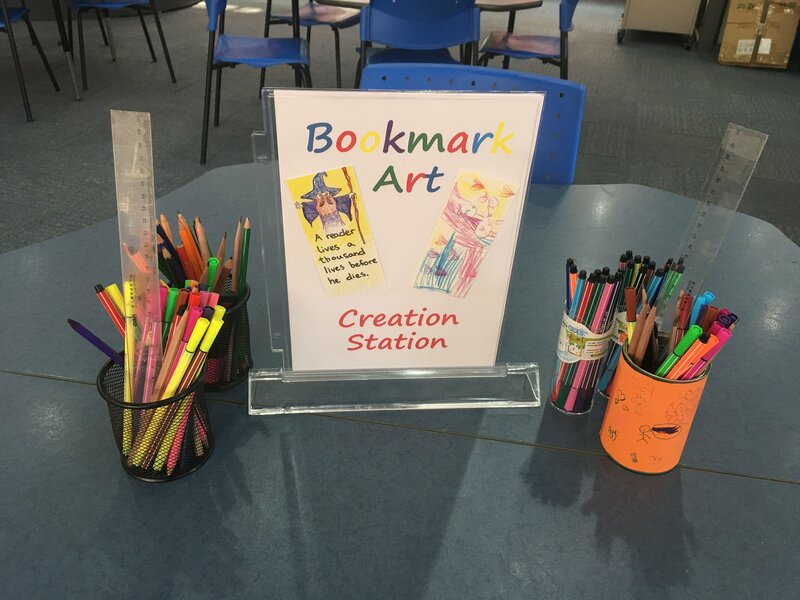 Set up a bookmark creation station in your library. Designate a table or two to bookmark art, and add lots of blank bookmark templates, markers, colored pencils, Sharpies, rulers, erasers, and pencil sharpeners if needed. The templates I use are available in the free download. Having students use the same-size templates will help keep printing costs down. I start out with about 200 blank bookmarks, but I will end up making more after a week or two. I print the templates on regular copy paper, not cardstock, to save on costs and wasted cardstock. The winning bookmarks will be printed on nice bookmark paper from a local print shop, so it does not matter if the drafts are created on plain printer paper. Using copy paper also means students can draw on as many blank bookmarks as they like. I can easily make more. Give your students lots of reminders during library time, especially as the due date nears. I also make sure the teachers know about the contest so they can encourage their students to enter. In my school's first Bookmark Art Contest, I coordinated with our art teacher to work with sixth grade classes to design their bookmarks. It was still up to the students to turn them in, and many of my first year's 60-ish entries were from our sixth graders. 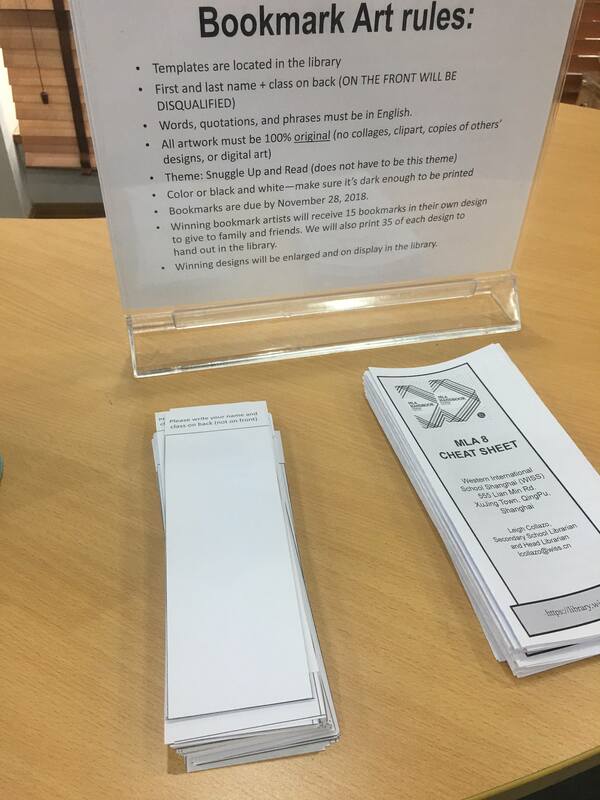 If you think the competition will be a slow start at your school, check with your Art Department and/or teachers to see if they can devote some time for students to design their bookmarks. Throughout the contest period, I continue to copy and print blank bookmark templates as needed. I go ahead and cut the templates since I have a nice paper cutter in the library. A tall stack of blank bookmark is available at the Creation Station at all times. Students are welcome to take as many as they like or need. Bookmarks can be turned in at any time during November, so I have a designated spot for them in my office. I use a printer paper lid to store the entries, and it works perfectly. When a student turns in a bookmark, I check that their name is on the back and just put it in the box lid. TIP: So that I am not bombarded with multiple entries from students, I allow them to create as many bookmarks as they want to, but they can only pick one favorite to turn in. I do allow them to "switch out" their bookmark if they later design one they like better. Some students will change their entry after turning it in, but it's not so many that it's overwhelming to manage. I want them to be happy and proud of their entries. When choosing your Voting Day, I suggest leaving a one- or two-day buffer between the due date and Voting Day to give you time to put all the bookmarks out and also to account for any last-minute entries (which always happen). This year, our bookmarks are due next Wednesday, and Voting Day will be next Friday. How you do voting day will depend largely on your school, your students, your teachers, and your schedule. There are lots of different ways you can do Voting Day, so you need to do whatever works for you. My first year, we had a committee of six teachers select our winning bookmarks. We selected our winners, and then we made up categories for the winning bookmarks. The categories included: Harry Potter, black and white, mystery, magic, most colorful, art teacher's choice, and librarian's choice. If you are just starting your bookmark art contest, this is the easiest way to select winners. Last year, we allowed the students to vote for the winners. This brings its own challenges, especially if you are in a larger school. In our school of about 800 students, we had to make sure every class had an opportunity to vote. 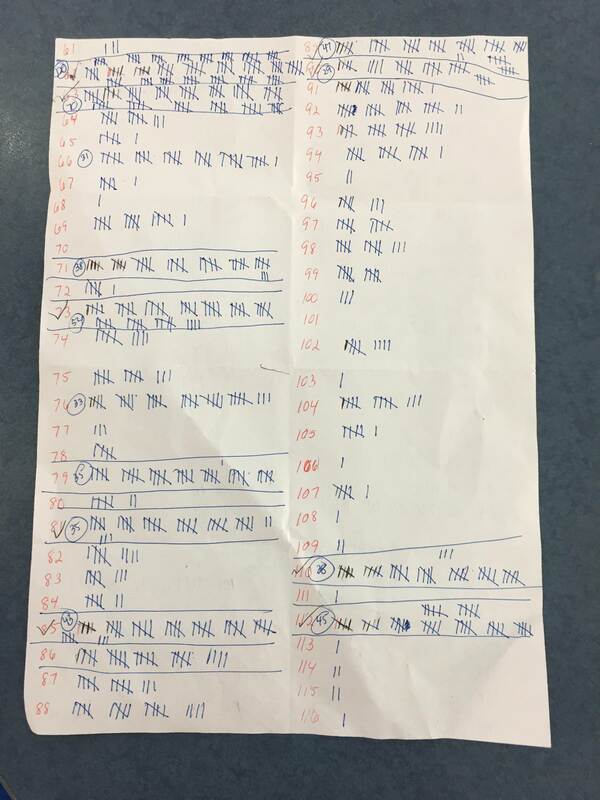 Then, we had to figure out a way to tally all the votes. 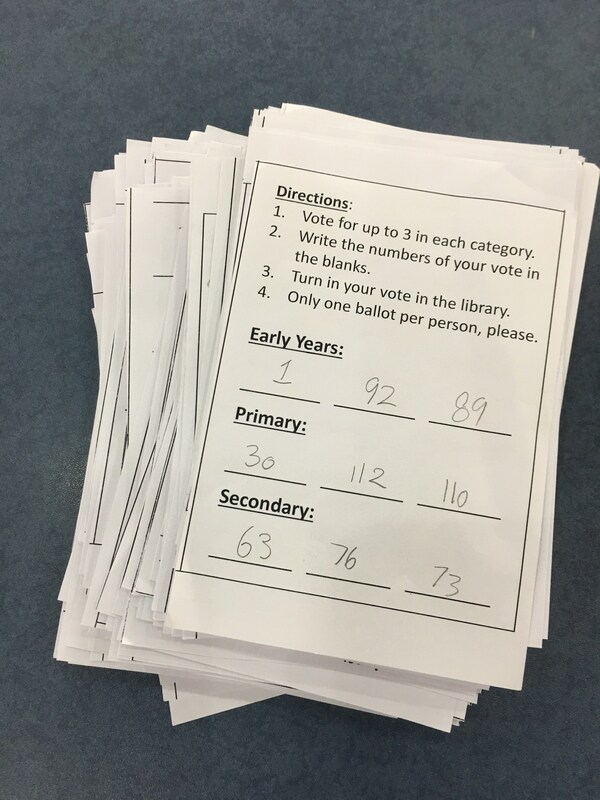 I created a paper ballot system (included in the dowload) where each student voted for three bookmarks in each school division (Early Years, Primary, Secondary), for a total of nine possible votes per person. Yes, this was a LOT to tally. It took a few hours of my weekend to do it, but I'm planning to do it this way again this year. The students loved being able to select the winners! The day before Voting Day, I tape up all the bookmarks in the hall outside the library. The bookmarks will grouped by school division and numbered #1-#200 (or however many entries we get). To vote, students write the number of their top three favorites in each division. They do not have to vote for three, but they can. All students are allowed to vote for all three school divisions. They absolutely love Voting Day! TIP: Take photos of Voting Day! They are great for the school yearbook and for your Bookmark Art Contest promotional video for next year if you decide to do that. 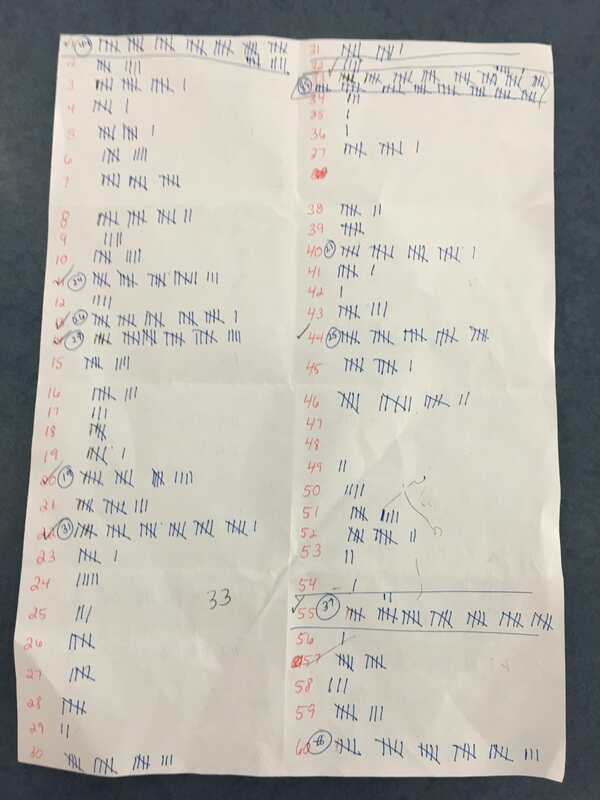 My voting tally sheet from 2017--we had over 1700 individual votes! Now the real work begins! I will tally votes over the weekend and announce winners the following Tuesday. I use Monday to take photos of the winning bookmarks and create an iMovie video to announce the winners. I then send the video to teachers to play in their classrooms. After winners are announced, I track down the artists and have them sign the back of their bookmark with their first name and their grade level. 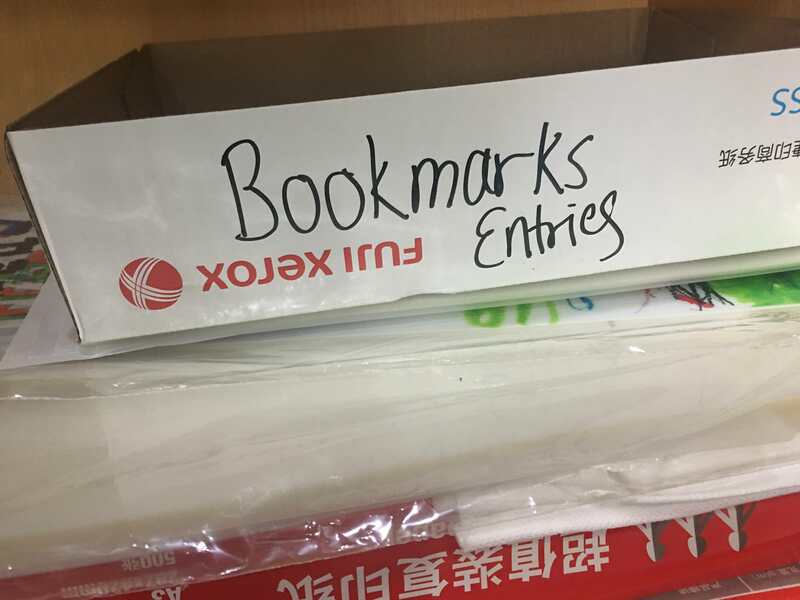 Be careful about students signing last names--the bookmarks could end up anywhere, and using their last names may be a violation of FERPA laws. The back of the bookmark also has the school's logo printed on it, so students could easily be tracked down if there is a custody issue or someone up to no good. Once I know the winners, I scan each bookmark and send the designs to a local printer via digital upload. Here in China, printing is cheap and quick, and I usually get the bookmarks back in just a few days. My goal is to have them back as soon as possible so students can give them away to family when they go home for the holidays. We print 50 of each bookmark (18 designs X 50 copies = 900 bookmarks printed). The artist gets 20 of their bookmark design, and the rest are given out in the library until we run out. I also have the printer create enlarged copies of the winning bookmarks for display in the library. I put a name-plate next to each bookmark. The name plate includes the artist's name and grade level. These will stay on display in the library until the end of the school year, then we give them back to the artists as an extra thank-you for all their hard work. Will you allow digitally-created entries? I love digital art, but I decided against it for the bookmarks because of inequalities in technology access. Everyone has access to markers and colored pencils in the library, but not everyone has access to Adobe Illustrator. Also, I think allowing digital entries will increase the likelihood of plagiarized entries and illegal use of clipart. The school is printing these with our logo, so we need to be extra-vigilant about copyright. Do you want to do more than bookmarks? If you want to do a fundraiser for the library, you could have students design mugs, postcards, or canvas tote bags instead. Give each artist a freebie mug/tote/postcard set, and charge a small fee for the rest. I'm sure you can think of something to spend that extra money on, right? Will you accept late entries? I allow the whole month of November for students to turn in entries, but I also build-in some flexibility about the due date. Last year, I scheduled Voting Day for the day after the bookmarks were due. The students voted all day long on Voting Day, starting in the morning, but I was still receiving new bookmark entries at lunchtime. Yes, they were a day late, but these bookmarks had no hope of winning if they were turned in at lunchtime on voting day. Give your kids a break and allow a day or two buffer to account for late entries. The point is to have fun and promote reading and art, not to punish a kid for being a little late or absent on the day they were due. How will you make voting as fair as possible? If you are whole school, will you consider age as a factor for the art? For example, my school is divided into Early Years (pre-Nursery through Kindergarten), Primary (Grades 1-5), and Secondary (Grades 6-12). If we voted without regard to age of the artist, the older artists would likely shut-out the younger ones. To keep it fair, we select six winners for each of the three divisions, for a total of 18 bookmarks. Yes, some of the the older students' entries are spectacular, but we want to give our youngest students a chance to win, too. How will you prevent this from being a popularity contest? We all know some students will just vote for their friends. To help mitigate it (at least a little), I do not allow students to include their name anywhere on the front of the bookmark. Names should only go on the back. This is also another way to prevent FERPA law violations if the bookmarks end up being printed. I tell my students that bookmarks with names on the front can be displayed and voted on and may even win, but I will not have them printed up. BOOKMARK ART PLANNING KIT AND MORE HOLIDAY HOP! 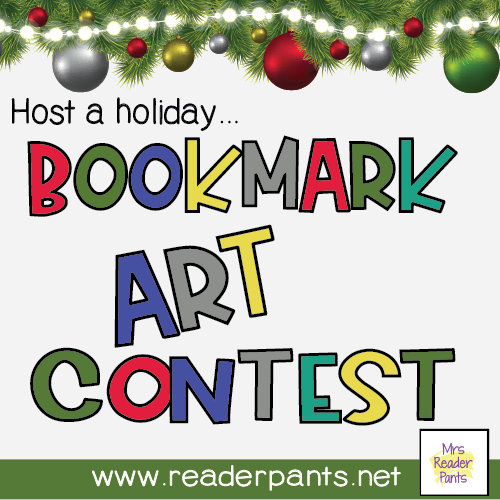 Planning your own Bookmark Art Contest? I have included a freebie planning kit on my TPT Store. The kit includes the bookmark template, ballot templates, and posters to help you get the word out. All are editable so you can customize the contest to your school. Keep on hoppin'! The next step in the Holiday Hop is Christmas Read-Alouds & Freebies from Laura at The Trapped Librarian! Enjoy! Have you done a Bookmark Art Contest in your school? What tips can you share to help other librarians make it successful? My students would love a bookmark art contest! Thanks for sharing such a fun idea! I do something similar to this, but I love the idea of letting every student get to vote. I have already downloaded your starter kits and will be trying them out with my students! Thanks for sharing!! This is such an awesome idea! Something about challenges/contests gets kids so excited - what a great way to get them talking about about books! I have downloaded the starter kit and the holiday kit! Thank you so much! :-) Happy holidays! This is such a great idea! - Thank you so much for sharing!!! What a great idea! I think I will tie it into our Book fair time! I can’t wait to do this with my students! This is a fantastic idea. I think my students will love it! I know some of my artist students would love this! This is a fun idea! A lot of work, but so rewarding! This is a great idea! So much fun. Wow!~what a great idea! My district does a card design contest that I wouldn't want to compete with or this would totally be happening in my library! 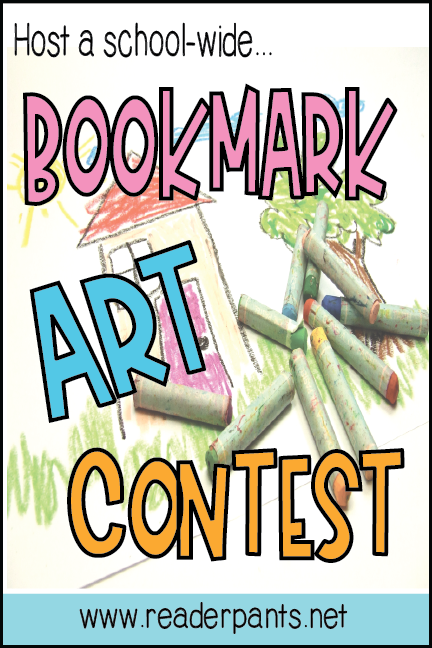 Students will love to enter a book mark design contest. Thanks for sharing! This is SO cool! What do you do with all of the bookmarks? Donate them to the local public library? The original bookmark designs are returned to the students. The printed "winning" designs are given out in the library throughout the school year (or until we run out, which we always do). Wow! I bet the kids love this activity. LOVE this idea! The examples are awesome. Thanks so much!! Aren't they talented? That little skeleton warrior guy was from a Kindergartener. So cute! You ladies have all outdone yourselves! I am set for the holidays with great ideas! Love these bookmarks! !